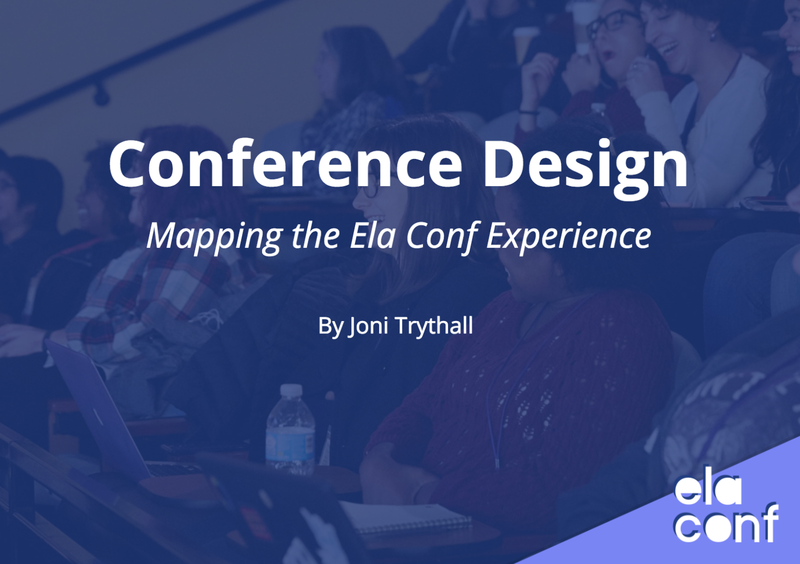 I, Joni, recently gave a presentation inspired by how often we receive feedback that people love the “feel” of Ela Conf and community. This “feel” is entirely intentional, a ton of work, and does not happen organically. There is a great number of both seemingly invisible and very visible aspects that collectively contribute to this so I set out to speak to some of these directly. This post serves as a detailed look into this presentation topic and slides can be found here. 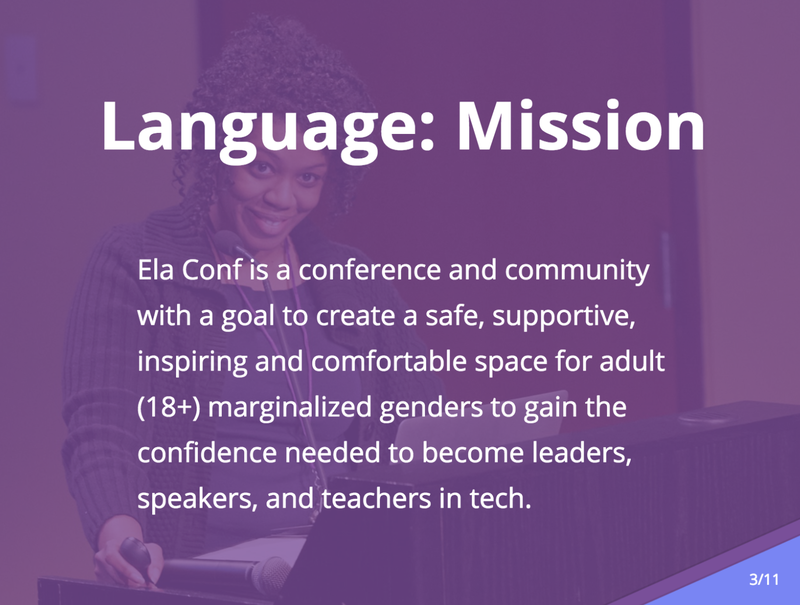 Ela Conf is a safe, inclusive tech leadership conference and community for adult (18+) marginalized genders to connect with and empower one another. Founded in 2015, the inspiration for this event began a bit out of frustration. 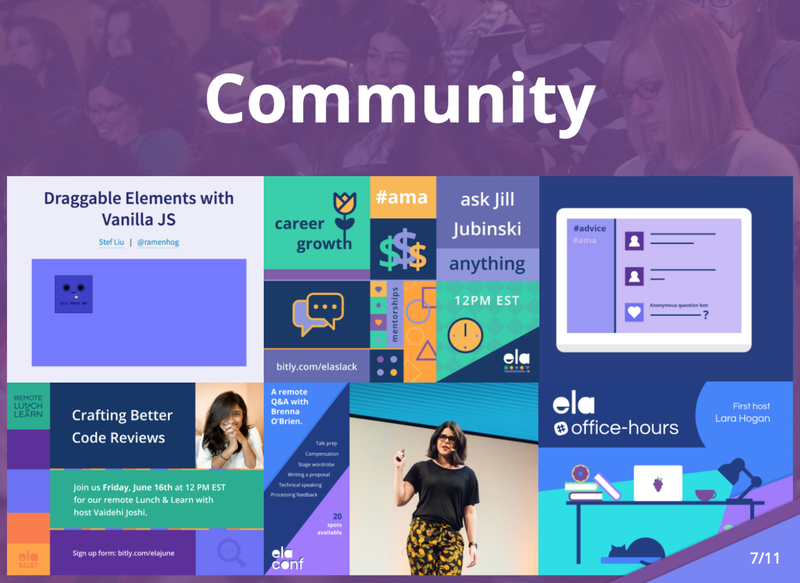 I was pretty fed up with the state of tech events and wanted there to be a better, more inclusive alternative so I decided to team up with a group of women I admire to start something ourselves. It was upsetting to continually see the same handful of web celebrities at each event talking about the same handful of topics. It sends a damaging messages to beginners that you have to have ten years of experience to be qualified to talk about something publicly, which is simply not true. It can be deflating and I have personally seen the negative effect this has on people. These existing events were excluding so many great individuals, often featured no women speakers, and seemingly putting no thought towards how to recruit new speakers and make them feel comfortable. Having been part of other tech groups I also noticed that women, including myself, were far more likely to downplay their achievements to others and I just couldn’t stop thinking about why that was and how to resolve it. I call them “achievement disclaimers” and felt that providing a space for people to share their stories with their peers and feel completely supported could help combat this instinct. Basically, there are countless conferences about certain technologies but not many that address strengthening leadership skills and, quite frankly, making friends with people going through similar struggles. We have been able to assemble a dream team of co-organizers over the years and our motivations to keep this going each year are very similar. While it started out as wanting to create a more comfortable space to exist in tech it has become the reason many of us have been able to stay in this space altogether. One of our first tasks years ago was to craft a short and thoughtful mission statement. We knew early on we wanted to be an event led by and for women, and our earliest language came with something of fine print that “woman” included anyone that considers themselves to be a woman in a way that is significant to them. After receiving some valuable feedback we discovered we were unintentionally insulting and excluding certain groups in that our fine print was in a way suggesting they weren’t real women. We changed this language to exclude the fine print and eventually refined further to include all marginalized genders. There was also some debate recently about the word “empower”, which we use a lot to describe the purpose of the conference, in that it can possibly be viewed as condescending. We actually created a GitHub issue about this, linking to justification for the different options. After meeting to discuss we ultimately decided to stick with and defend the use of the word in this context. We don’t believe that women need to be empowered by others but there is something uniquely special about a community that is so dedicated to lifting up others voluntarily and being supportive whenever possible. Our mission helps us stay on task and not get derailed, creating an incoherent experience. We all constantly have a bunch of ideas and it can be very exciting, but ultimately if it’s not in line with our mission it’s not appropriate for the group to pursue. There is enough to do that is perfectly suited with our mission and we don’t want to get distracted from that, jeopardizing the experience that people have come to support and trust. Harassment can take many forms and it would be reckless to trust the community to organically follow a set of unspoken rules on accepted and unaccepted conduct. 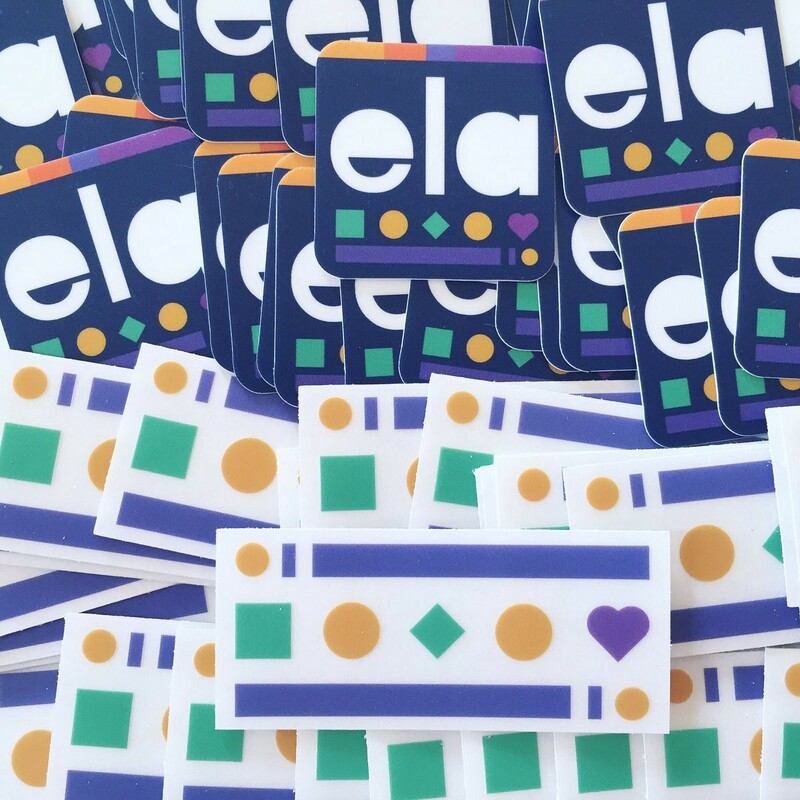 The COC is easy to find and all involved with Ela events are required to acknowledge that they are aware of and agree to our harassment policy. We are also working on defining and publishing our specific harassment action plan so that there are truly no surprises and attendees can feel especially reassured that this is a priority for us. Up until recently I have been the main person managing our social media accounts, but that is starting change with a fifth organizer. I’ve always followed a set of rules and worked to maintain a certain tone and personality through these accounts. I have started to actually write these rules in my head down with the goal that anyone can follow, maintaining consistency. I am always sure to keep the language positive, humble, and welcoming, which includes emoji selection; when you think about it there are a lot of emojis that are not at all appropriate to use in this environment. 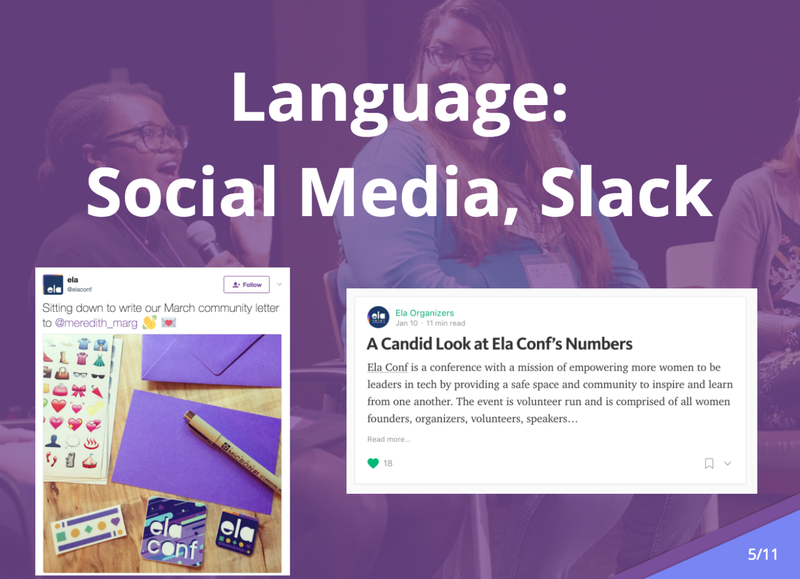 Our Slack channel is one of our greatest contributors to setting the voice and tone for the conference in the fall. As soon as someone accepts an invitation to the channel they receive a welcome message in their Slackbot where we list the most popular channels and invite them to introduce themselves to the group in a special #sayhello channel. The letter also mentions how to contact each of the organizers and where to find our event calendar and conference updates. While we utilize volunteers (and truly appreciate their contributions!) the day of the conference and as speaker mentors the year-round planning and logistics are completely handled by organizers, three of five of which are founders. From experience we have found that individuals with more invested roles, with their name on the conference so to speak, can be much much more reliable, dedicated, and motivated for these more extended obligations. Until recently we had always collectively operated under similar unspoken values. We used our search for a fifth organizer as the motivation to write these down and document them internally, which we later published here on our blog. Among our agreed upon core values was transparency (both amongst each other and the the community), sharing knowledge, autonomy (we trust each other to simply run with things), humility, genuineness, and we put a lot of value in constructive friction. Someone willing to push back when necessary in a caring and convincing way is always a great team addition. 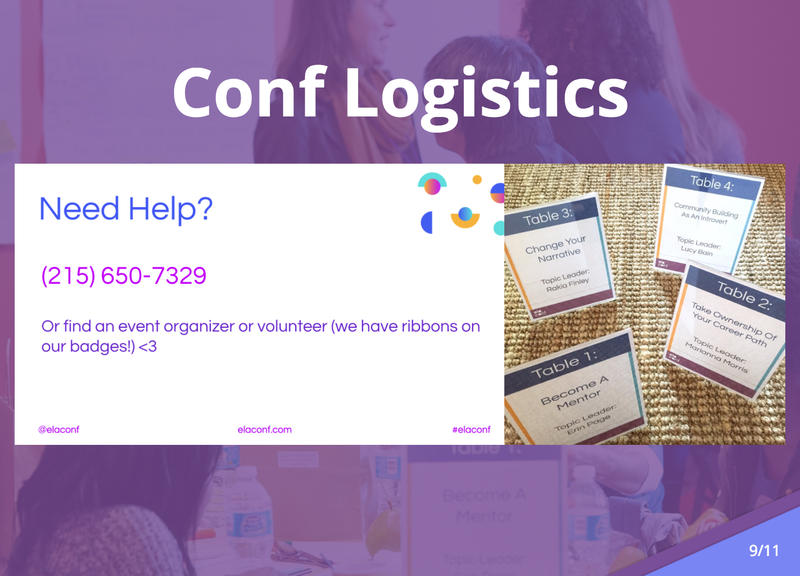 Having internal guidelines for the brand, tone, and making sure all organizers stand behind a set of core values enables us to deliver a consistent message, building trust and respect in the community from potential speakers, attendees, and sponsors. Our visual identity is designed to be simple, inviting, and fun. I use purple and a different take on basic shapes each year. We knew from the beginning that we wanted to avoid overtly feminine imagery, but also not go too far into an overly serious and stark direction either. Another way we maintain high quality and consistency is through process and automation, which Katy wrote a bit about last year here. Without this many tasks would scale beyond what is reasonable. We all work full-time and it’s important this community doesn’t lead to burn-out on our end. We use GitHub projects to manage absolutely everything. When we receive an application a bot notification and summary post in our private organizer channel and the proposal is then added as an issue to our speaker repo. We do initial voting and labeling there. All Slack invite requests are posted directly to this private channel, eliminating the need to frequently go check the Google spreadsheet because we were really terrible about that. There is also a list of checklists for specific events and tasks, such as Lunch & Learns. Regardless of which organizer is managing each month’s Lunch &Learn the same exact process will be carried out, eliminating unknowns for both us and community members. Above all we are genuine. We share our struggles and successes and truly want to help people and make this space better than how we found it. 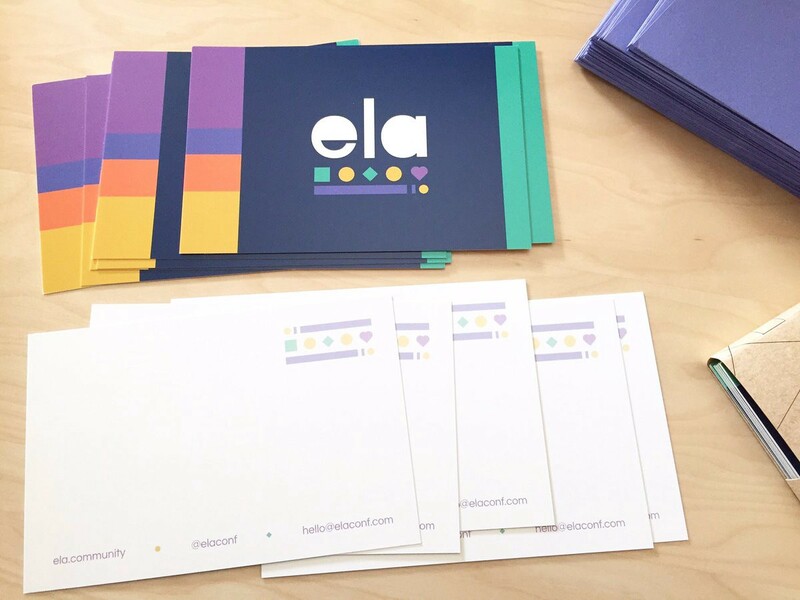 Ela has gradually worked towards a year-round, remote community which enables us to expand our reach, reaffirm our brand and mission, and gain organic exposure for the conference in the fall. 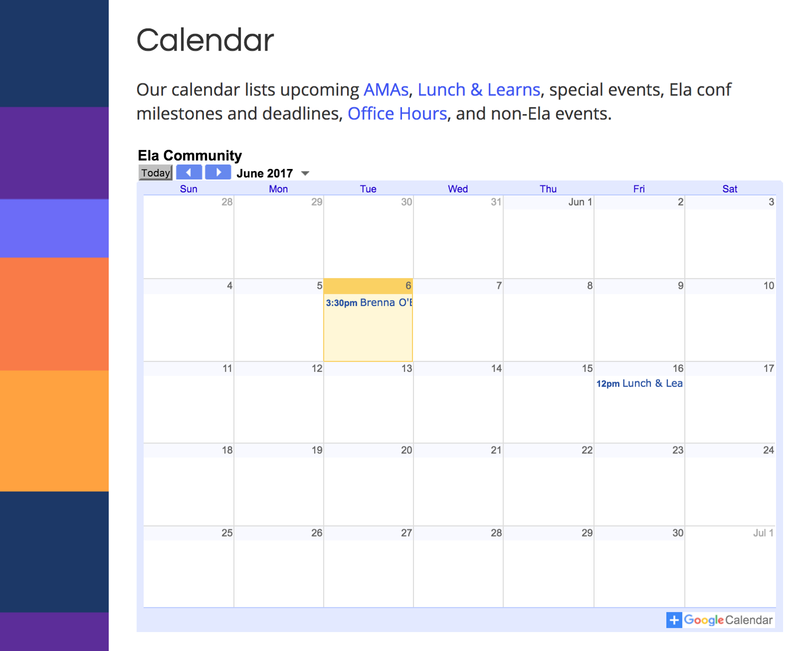 Our community calendar lists all upcoming Lunch & Learns, AMAs, special events, and various conference deadlines. Special events generally correlate with significant conference planning milestones, so for example, we had a technical public speaking coach host a Hangouts for the group to talk about things like writing a successful talk abstract before we open ours July 1st. We also randomly select an active community member to receive a handwritten card and event stickers each month. These are low effort on our end but it has a significant impact in making individuals feel welcome and excited about being part of the community. Part of drawing first time speakers to an event is having a support system in place for them; we don’t want to set anyone up to fail here as that would reflect poorly on us as well and mean we are not doing our jobs. We recruit experienced volunteers to match up with chosen speakers to help prepare for their talks. We’ve noticed that about 80% of our speakers, even the experienced ones, request a mentor and find this interesting. We can all use a hand and someone to run ideas by and this service goes a long way in enabling speakers to feel as confident and as prepared as possible. Our Slack channel truly is all about supporting one another. Our most popular channel is #advice and members can now ask anonymous questions which has significantly increased engagement. We were getting feedback from people that they wanted to ask questions but personally knew too many people in the community and didn’t feel comfortable asking more sensitive questions. These types of questions are the most important and urgent so we set out to resolve this right away. There was a very popular talk last year about the importance of “squads” and having a group of friends that are also in tech that can relate to struggles and provide support. Since then we have had requests to start regional squad channels where members plan group dinners and outings. So far I’ve talked a lot about the continuous efforts of molding this experience but there is of course also a lot we do during the event itself. It’s crucial to us that childcare and finances not be a barrier for anyone that wants to speak at or attend Ela Conf. We provide a per-child childcare stipend and pass along a list of recommended providers based on community input. All speakers are reimbursed with stipends for travel and lodging, which includes two nights in a hotel so no one has to frantically leave the conference early. If someone wanted to speak at the conference but had to decline because they couldn’t afford it that would mean we are not doing our jobs and ultimately contributing to the very problems we are working so hard to overcome, in that tech is a place for the most privileged among us. We also provide financial and diversity grants each year and so far have been able to give these to 100% of applicants because of our sponsors. The conference kicks off on a Friday evening. These extra few hours significantly contribute to our budget but we have come to regard it as essential in crafting a comfortable experience where there are fewer unfamiliar faces on Saturday, the full day event. Conferences can be incredibly stressful and awkward. Friday evening serves as a casual meet and greet and you can really feel the difference the next day as a result. Possibly the most difficult time during an event at that scale is lunch. Where will I sit? Who will I sit with and how? What will we talk about? We manage to eliminate these fears and even make this time something people look forward to by planning lunch table topics. Lunch table topics are chosen from our speaker applications as we ask all applying if they would be comfortable presenting their topic in this setting or in a panel if necessary. The presenter gets a chance to lead a conversation about a topic they are familiar with and attendees are able to connect and avoid all the factors that can make these lunches unbearable. We publish a survey each year after the event and make the results public. Knowing what to take to heart and what to let go is always an interesting exercise in emotional strength, but we take these seriously and find that our sponsors appreciate them as well as they can better understand our demographic and strengths. It allows us to identify any gaps in service and diversity and then develop plans of action. All five of us are very accessible and have set ourselves up to regularly get feedback. 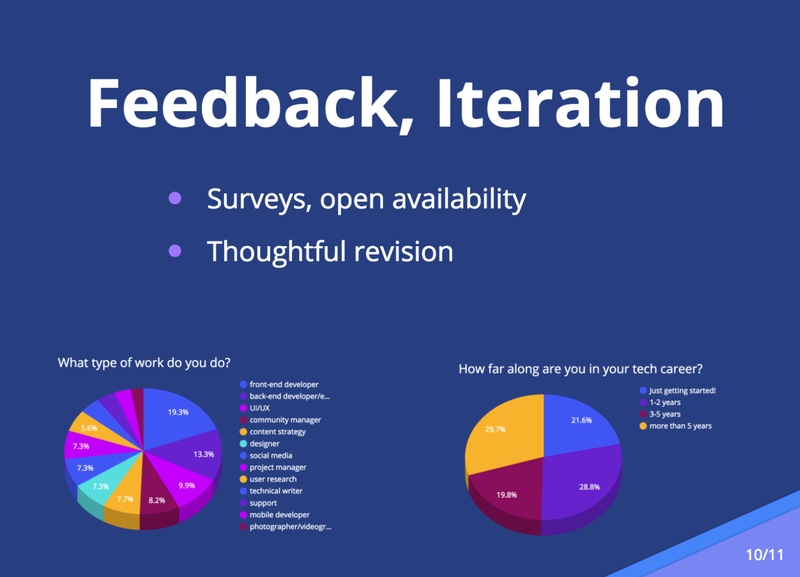 When we are approached individually with feedback or advice we open up an issue in GitHub to consider as a group. A conference and community all about empowering more women (cis and trans), trans men, and genderqueer people to be leaders in tech.